The format of the 2014 Compliance Recertification Application (CRA-2014) is the same as that used in the CRA-2009. The CRA-2014 follows the structure and organization of the sections of 40 CFR Part 194. This format aligns with the format used in the U.S. Environmental Protection Agency's (EPA's) Compliance Application Review Documents and is intended to facilitate the EPA and stakeholder reviews of the application. This format is expected to allow a direct evaluation of any changed information with respect to previous applications. In each section of the CRA-2014, information that is "new" since the CRA-2009 is located in Section 7 through Section 9. In most cases, "old" text is unchanged except where it contained errors or omissions, to reflect changes in references/citations, and to change verb tense in text describing future events that have now taken place. The CBFO Quality Assurance Program Document is now included as a reference instead of as an appendix. CRA-2014 Section 23 and Section 34 retain the format that was used in CRA-2009 and differ slightly from the format described below. In Section 23 and Section 34, the information contained under "Background," "1998 Certification Decision," "Changes in the CRA-2004," etc., is provided for each first and second level paragraph of the CFR (194.23(c)(1), 194.23(c)(2), etc.). In the remainder of the document, information contained under "Background," "1998 Certification Decision," "Changes in the CRA-2004," etc., is provided at the section level (e.g., 194.15). 1. Requirements: The text of the regulation. 2. 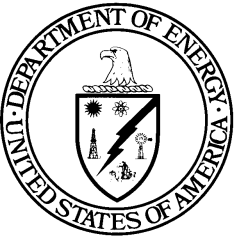 Background: The historical context of how the U.S. Department of Energy (DOE) and the Waste Isolation Pilot Plant (WIPP) have complied with the regulation. 3. 1998 Certification Decision: A summary of the Compliance Certification Application (CCA) and the EPA's evaluation of compliance to the regulation. 4. Changes in the CRA-2004: An identification and summary of changes from the CCA to the CRA-2004 directly related to the regulation. 5. EPA's Evaluation of Compliance for the 2004 Recertification: A summary of the EPA's evaluation of the CRA-2004. 6. Changes or New Information Between the CRA-2004 and the CRA-2009 (Previously: Changes or New Information Since the 2004 Recertification): The changes that resulted from continuing scientific investigations and operations at the WIPP during the time period between the submittal of the CRA-2004 and the appropriate data cut-off date of the CRA-2009. 7. EPA's Evaluation of Compliance for the 2009 Recertification: A summary of the EPA's evaluation of the CRA-2009. 8. Changes or New Information Since the CRA-2009: The changes that resulted from continuing scientific investigations and operations at the WIPP during the time period between January 1, 2008, and the CRA-2014 data cut-off date of December 31, 2012. 9. References: References cited in the CRA-2014 documentation. References that were not submitted in any previous CRA are followed by an asterisk. At the request of the EPA, an electronic version of the CRA-2014 is included in this application. The electronic version includes hyperlinks to all references cited in the text, except for copyrighted references. Sections, appendices, and attachments included in this application are listed below. There are many cases where an appendix contains technical information similar to that covered in a section. In these cases, the section is a summary of the information provided in the appendix. 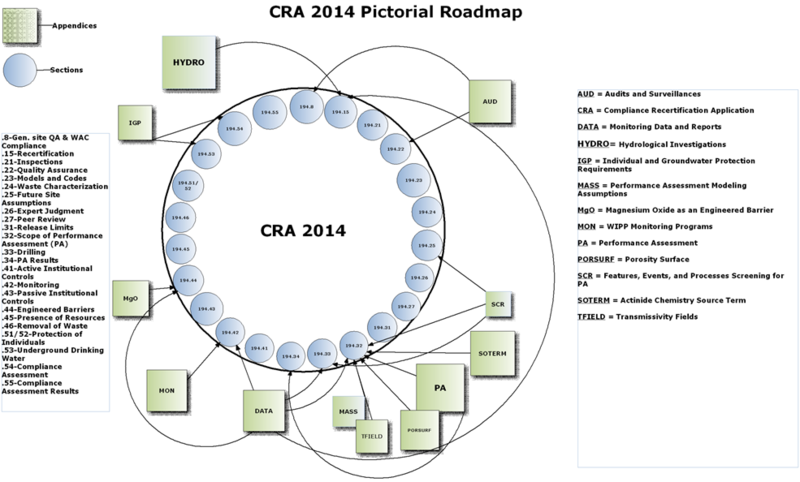 Figure STRUCT-1 maps all 23 sections and 13 appendices and the relationship of each appendix to specific sections in the CRA-2014.